This is our weekly look at fantasy adjustments you should make based on venue and/or weather. Entering Week 6 of the NFL season, knowing which players should see an improvement or decline in their projection can be a key to victory. Tropical Storm Michael raged through my Carolinas but headed out to sea before it reached New York, host of Friday night’s Eagles/Giants game. It’s the second major storm of this NFL season, but the sport has been fortunate to avoid a game-day strike. That leaves a small handful of games with weather implications, but as always, the home/road impacts are quite meaningful for fantasy. Elite subscribers can peruse the full list of my venue and weather adjustments, and I’ll touch on the most interesting of them here. The Falcons host their division rival Buccaneers at home in the dome Sunday. It is one of four games this weekend in a dome, and all four home teams — the Falcons, Vikings, Cowboys, and Texans — should enjoy a fantasy bump from it. It’s more difficult to come up with attractive fantasy options for the visiting Cardinals, Bills, and Jaguars, but I think the Buccaneers have some interesting sleeper options given the Falcons’ defensive struggles. 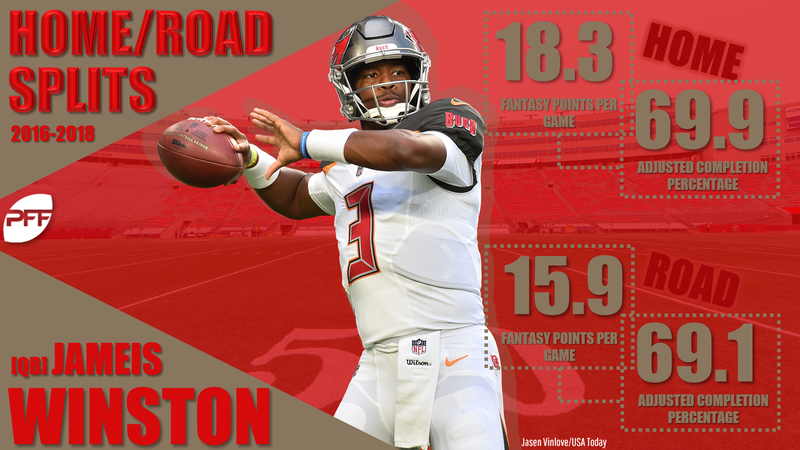 Those begin with new-old starter Jameis Winston (-0.2). His road downgrade is less severe because of the dome, and he historically has shown small home/road splits in any case. Since 2015, he has scored just half a point less on the road than at home. I have him as my No. 11 quarterback this week. Even without O.J. Howard, he has the receiving talent around him to buoy his fantasy prospects. With respect to that receiving talent, Mike Evans (-0.3) is an obvious start in all formats, and DeSean Jackson (-0.2) is a boom-or-bust flex consideration as my No. 29 PPR receiver and No. 62 flex player. I’ve ranked rookie running back Ronald Jones (-0.2) 38th at his position based on what I see as the most likely scenario for the week, but the timing of the his 10-carry debut in Week 4 leading into the team’s bye hints at a possible changing of the guard. He and Aaron Jones on the Packers are the two poorly ranked backs I would be least surprised to see have an RB2 performance this week. I wouldn’t start Peyton Barber (-0.5) unless I had no other option. The Falcons have a lot more obvious starts, and for me, Calvin Ridley (+0.5) has joined those ranks. The plus venue and opponent matchup jumps him from 21st in my true-talent receiving rankings to 14th. Get him in your lineups. Most of the NFL cities have finally entered their autumns, but Denver seems to have skipped straight from summer to winter. Their late afternoon game Sunday is forecast to stay below 30 degrees for its duration. The forecast I’m using for these projections doesn’t show any likely precipitation, but AccuWeather shows a 30-60% chance of snow in the morning and early afternoon leading up to game time. Even without the snow, my research shows that teams pass 2.2% less and quarterbacks complete 3.1% fewer passes for 0.19 fewer yards per attempt in below-freezing temperatures. Things would only get worse for passing if snow starts to fall. That’s bad news for Jared Goff (-1.0) and his big three receivers Brandin Cooks (-1.4), Robert Woods (-1.4), and Cooper Kupp (-1.2). Goff falls from my No. 5 true-talent fantasy quarterback to 10th. The receivers all hold onto WR2 rankings, but I wouldn’t use any of them in daily games. With the weather and after the Jets’ tandem of Isaiah Crowell and Bilal Powell gashed the Broncos for 318 yards on the ground last week, I expect the Rams to rely even more heavily on Todd Gurley (+0.7) than usual. As I harp on pretty much every week, Joe Flacco (-2.5) has some of the most extreme home/road splits in football. This should be a particularly difficult road matchup for Flacco and the Ravens’ passing game. Not only is there a chance of rain, the Titans defense has flipped from last season to be stronger against the pass than the run. You can get away with John Brown (-1.1), my No. 30 PPR receiver. Michael Crabtree (-1.2) is 38th and shouldn’t be in your lineups. The Titans’ bad run defense has resulted in more rushing yards than touchdowns, and so I would still avoid Alex Collins (-0.5). He’s my No. 35 running back this week. Javorius Allen (-0.1) makes more sense as the team’s primary passing-down option and given John Harbaugh’s comments this week about his commitment to a committee. Just don’t drop Collins. My efficiency metrics continue to prefer him to Allen, and I think the workload will skew his way sooner or later. Monday night’s Packers game provides the first really good example this season of meaningful temperature drops over the course of a night game. Kickoff is forecast to be a cool 45 degrees, but that temperature should drop a good 10 degrees over the course of the game. Especially in the second half, those colder temperatures should hinder the teams’ passing attacks. Those weather concerns don’t put much of a dent in Aaron Rodgers’ (+1.6) projections. Being at home more than counterbalances the half a point loses for the cold, and the 49ers are among the five friendliest matchups for passing touchdowns. He’s my No. 1 quarterback for the week. Davante Adams (+0.5), Geronimo Allison (+0.3), Randall Cobb (+0.2), and Jimmy Graham (+0.3) get fantasy boosts, as well, assuming they all play. I wouldn’t be stunned to see the Aaron Jones (+0.4) breakout here, either, if the Packers can build a lead and need to kill clock in the second half. But with the team’s commitment to a workload split, I have Jones ranked meagerly as the 39th fantasy back.